Gaskins Co., Inc. Safety Valve Design Descriptions | Gaskins Co., Inc. 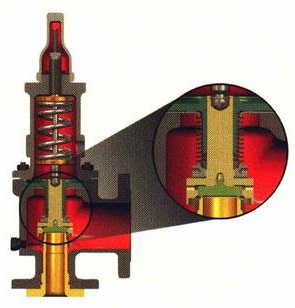 Conventional safety relief valves are for applications where excessive variable or built up back pressure is not present in the system into which the valve discharges. The operational characteristics (opening pressure, closing pressure and relieving capacity) are directly affected by changes of the back pressure on the valve. Comment: These design valves are typically equipped with a bellows which balances or eliminates the effect of variable or built up back pressure that may exist in the system into which the safety relief valve discharges. 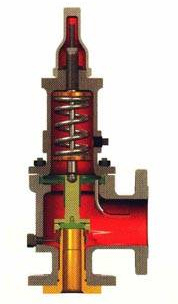 A pilot operated safety relief valve is a pressure relief valve in which the major relieving device is combined with and is controlled by a self-actuated auxiliary pressure relief valve. Comment: Pilot operated relief valves are available in both pop action and f modulating action designs. These valves are suitable for applications where it I is desired to maintain system operating pressure very close to the valve set I point (operating pressure).